Nimbin "Chill or Tour" Option. After 1 hour in Nimbin you can come along with us on a mini tour that will give you great insight into Nimbin's Alternative Lifestyle, (Permaculture and alternative energy), Nimbin's fascinating history and culture, plus a short visit to Nimbin candle factory. This tour runs from 1:30 - 2:30 approx so there is still time for light refreshment before heading off for Mt warning. Nimbin has to be seen to be believed, It's an old Dairy town situated right next to the Nimbin Rocks, one of the most sacred places of the Bundjalung people. When the Dairy Industry crashed, the hippies moved in and started buying the cheap, fertile land and building communities and co-operatives, using alternative energy and farming methods, planting trees and preserving the local forests. It is the only place in Australia where alternative culture is the dominant culture. It is colourful, unique and very interesting. 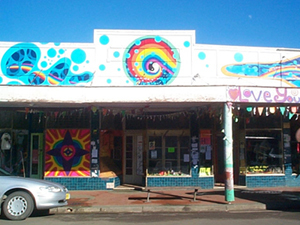 There is so much to do and see in Nimbin that you may wish to stay longer. 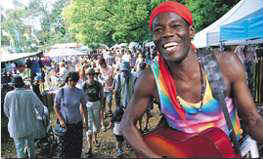 you are welcome to stopover in Nimbin and catch up with the tour another day. Check out our accommodation page Nimbin has a wide range of accommodation styles to suit all cultures and budgets. 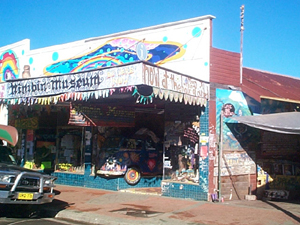 Nimbin Museum - the only legal trip in town. Nimbin Aboriginal Arts and Craft Centre. Nimbin Hemp Embassy and Hemp Bar activist Kiosk. Free Town Pool and BBQ's. Local Border Ranges and Nightcap National Parks.